In November, I’m still harvesting fresh herbs from my garden to complete a dish for dinner or a party. Even though most of our garden sleeps during the winter, a few hardy herbs like rosemary, thyme, sage, and savory will persist into the snowy weather. It’s no surprise that they pair so well with the foods of the season: roasted poultry, squash and root vegetables, cranberries, apples, and baked goods. Whether you’re harvesting these herbs straight from the garden or “cheating” and purchasing them from the Co-op’s produce department, the few minutes it takes to add fresh herbs to these dishes are worth the amazing flavor. Sage and thyme offer classic flavors to stuffing. 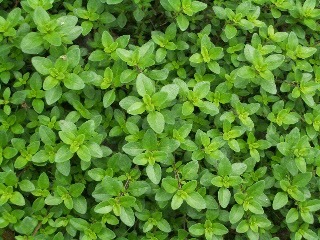 For 12 servings of stuffing, chop 1 to 3 tablespoons of fresh herb leaves and fold them into your stuffing. Add 1/2 cup of chopped fresh parsley for bright flavors. refrigerate to harden slightly before serving. Using the same technique, add roasted garlic and finely chopped rosemary leaves to softened butter. In a food processor, blend any tender herbs into softened butter, then add that butter to mashed potatoes. Parsley or chives work well. Use 1/4 cup of herbs and 6 tablespoons of butter per 2 pounds of potatoes. Sage brown butter adds creamy goodness to mashed squash and pureed root vegetable soups and chowders. In a small skillet, fry a handful of whole, fresh sage leaves in a half stick of butter. You can use the fried leaves as a garnish or remove them before adding to your recipe. Frying sage transforms and mellows the flavor. For roasted squash and root vegetables like potatoes, add several whole sprigs of rosemary, thyme, and/or savory to the pan. Or fold in chopped chives a few minutes before the vegetables are done roasting. I’m a cranberry purist, but a sprig or two of fresh rosemary infuses nicely in homemade cranberry sauce (remove before serving). Or make this easy cordial: On the stove, dissolve 2 cups of sugar in 1 cup of water. Add cranberries and cook until tender. Fill a mason jar halfway with the mixture, then top it off with quality vodka and a few sprigs of rosemary. Let sit for two weeks, strain. Serve solo or in cocktails at parties. It also makes a nice gift. Maria teaches and sees clients throughout the country. Her first herbal wellness book is due out from Storey Publishing in February 2016. Visit www.wintergreenbotanicals.com for more herbal recipes.